Apple apps are packed with helpful features. For example, both Preview and QuickTime Player include a multitude of superpowers that many folks aren’t aware of. Unless you click every button and scour every menu, you’re likely not using the app to its potential. 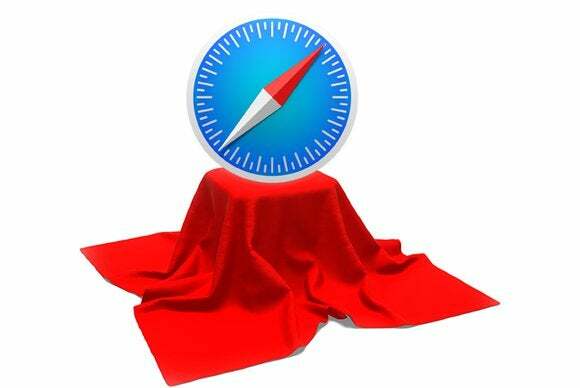 In this column, you’ll discover seven handy tips for using Safari the next time you’re surfing the web. If you’re perusing one site and you wish to visit another, you don’t have to click within the address bar, highlight it and then delete the existing address. Instead, press Command-L to highlight the current address and immediately enter the new one. It’s also unnecessary to enter http:// or www. Simply enter the domain, such as macworld.com, and then press Return to transport to that site. 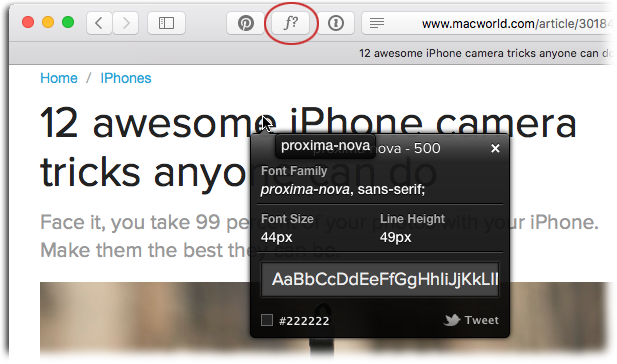 Further, Safari, by default, no longer displays the full address of the web page you’re visiting. For example, when viewing this story, the address simply reads macworld.com. If you want to always see the full address, choose Safari > Preferences> Advanced and then turn on Show full website address. To see the full address of any page, turn on the option circled here. If the web page content is too small to read, you don’t have to squint; you can enlarge it by pressing and holding Command and then tapping the + key on your keyboard (use Command – to reduce size). To enlarge the text but not the images, choose View > Zoom Text Only. To specify a minimum font size for Safari to use, choose Safari > Preferences > Advanced and enter a larger size in the Never use font sizes smaller than field (it’s visible in the screenshot above). 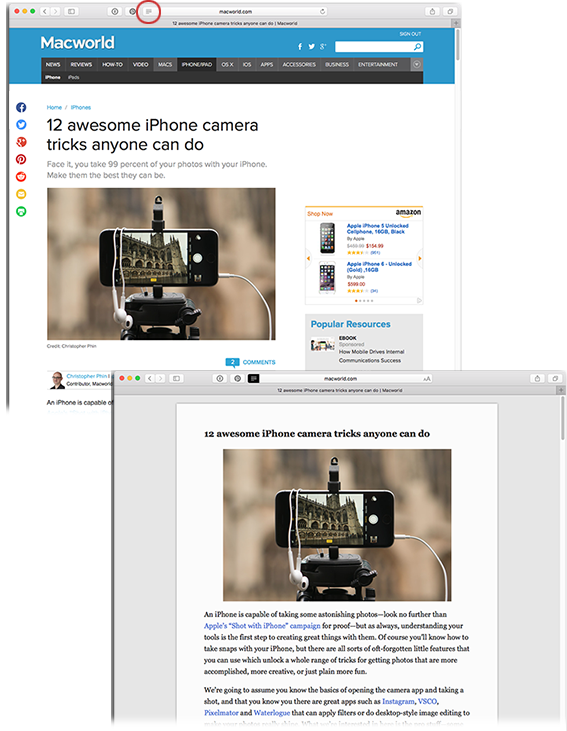 Using Reader View makes a web page feel more like an ebook. Alas, ads are necessary to the monetary health of many websites, though they can make it difficult to focus on reading—especially when they (gasp) blink or talk back to you. Happily, you can eliminate all that by clicking the icon at the far left of the address bar (it looks like four tiny lines) to enter Reader View. When you do, you get a gorgeous, distraction-free view of the page (click the same icon to return to the standard view). Choose Reader from the menu circled here to send a distraction-free webpage to your recipient. You can view all manner of imagery in Safari, as well as play animated GIFs. You could use Safari’s File > Open command but you can also drag a file atop a Safari window to see what it’ll look like on the web. If the colors don’t look like you expect them too, it’s because the image is in a color space other than the Internet’s native sRGB color space (see this column for more on sRGB). The image’s pixel dimensions appear in the new tab that opens. 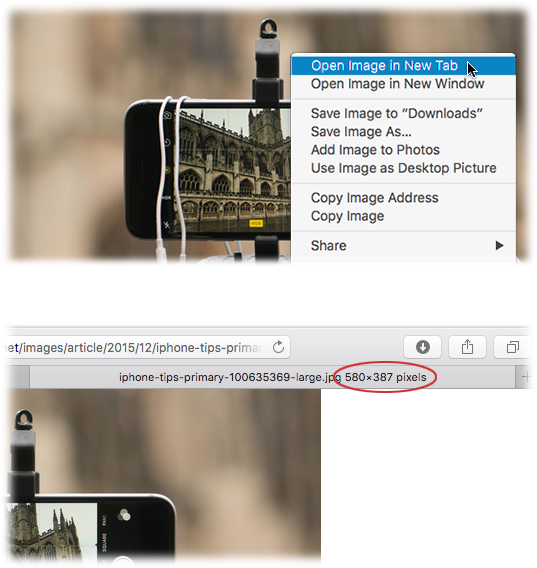 You can peek at the pixel dimensions of most web images by opening them in a separate tab. This is incredibly handy if you’re designing an image for the web and need to match the size of an existing image. To do it, Control-click the image and from the menu that appears, choose Open Image in New Tab. When you do, a new tab opens containing the image and its dimensions appear to the right of its file name. If you encounter a webpage and you love the fonts, you don’t have to dig into the HTML to find out what they are. Instead, install Chengyin Liu’s free WhatFont browser extension or download their iOS app. To download the browser version, visit their website; to get the iOS version, fire up the App Store on your device and search for WhatFont. If you want to learn more about a font, click it to reveal the window shown here. It works on Adobe Typekit and Google Fonts, too. 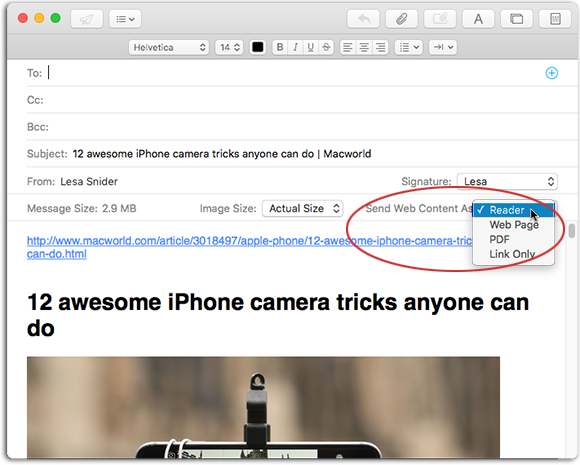 As you can see, Safari has a lot of tricks up its sleeve. Until next time, may the creative force be with you all!